Free Shipping Included! 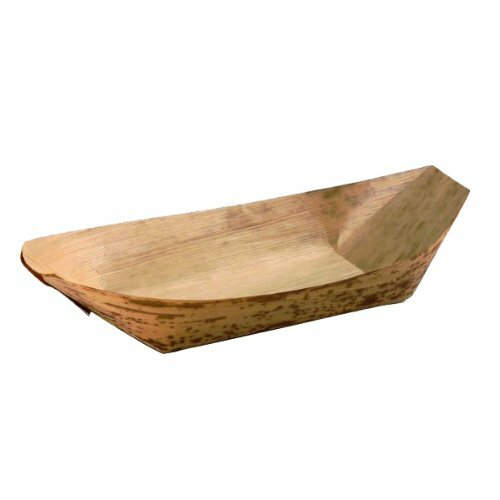 PackNWood 210BJQ12 Bamboo Leaf Boats - 2 oz - 4.9 x 2.3 x 0.4'' - 1000 per case by PacknWood at Blog Free Here. MPN: 210BJQ12. Hurry! Limited time offer. Offer valid only while supplies last. Made of bamboo, our biodegradable, disposable and decorative, boat-shaped bowls are multi-purpose. Use either as a serving dish, or food display. Made of bamboo, our biodegradable, disposable and decorative, boat-shaped bowls are multi-purpose. Use either as a serving dish, or food display. Great for displaying a variety of items, it's an elegant way to make a statement at any event or home. Comes in multiple sizes. The bamboo leaf collection offers a unique look and texture and bamboo leaf naturally preserves food! Bamboo Leaf Tableware is 100% natural and biodegradable. Please note that the items and sizing may not be exactly as shown and/or indicated due to natural variations in raw materials. Capacity measurements in oz/ml are only approximations. PacknWood is a well-established French manufacturer that specializes in the design and manufacture of elegant disposable food packaging. PacknWood offers the largest selection of plates, skewers, mini dishes, bake ware, serving-ware which are made from the most unique and natural materials: Bamboo, Wood, Palm Leaf, Sugarcane and Cornstarch all with a French touch to the design and presentation.